Poorly-made signs confuse your users - Harold Tor. The manager of this branch of Carrefour supermarket should be fired. The door of this entrance has not been working since time immemorial. 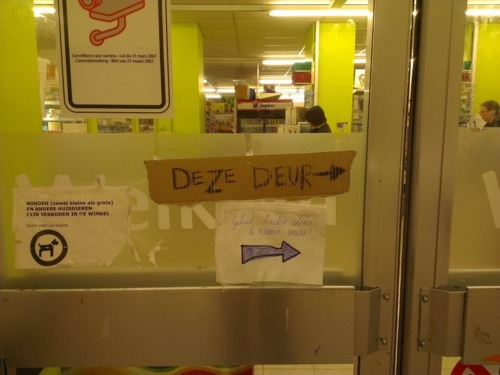 Instead of mending the door, staff tried to prevent customers from using the left door by putting up very poorly-made signs telling them to use the right door. The result: customers continue to push both doors and the already broken left door suffers further damages.